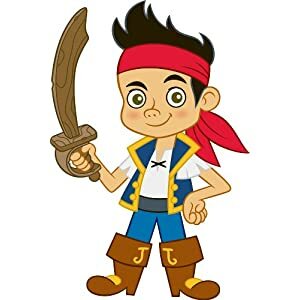 Home Kids Room Decor Archive by category "Kids Character Themed Rooms"
In decorating a groovy kids space sometimes it’s the little things that matter most. 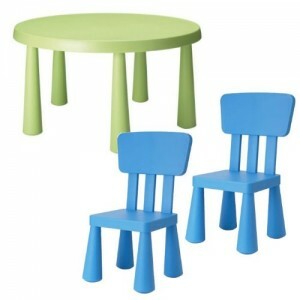 A well placed wall decal or even a matching chair will make of break your kids theme. There just are no words for how flipping cool this chair is! It measures 16″L x 23″W x 20″H. Which means it’s for toddlers & kids up to about age 7…Don’t get this for a 12 year old. 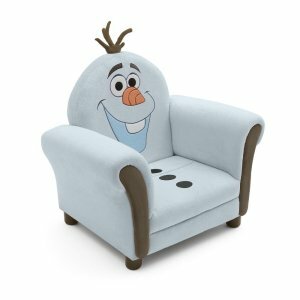 Olaf features an embroidered face with spiky hair accents and buttons on the seat. It’s clearly the coolest Frozen chair on the market! 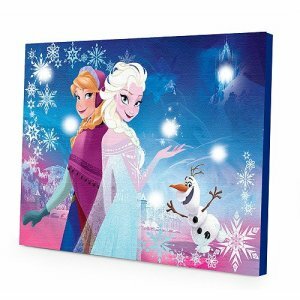 This is not only wall art featuring Elsa, Anna and Olaf…it lights up! It comes with 6 LED lights that make this piece a sparkling delight. The canvas measures 11.5″ x 15.75″ I’m not sure why the reviews aren’t stellar because we have a Ninja Turtles version that is fabulous! The soft glow of the LED lights allow the canvas to be used as a night light, so kids can sleep more comfortably at night. Powered by batteries, this print can be hung wherever you like. It can serve as decoration by itself or as part of a larger Frozen room scheme. 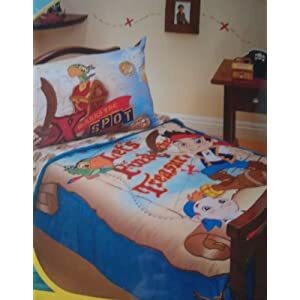 You can’t go wrong with Olaf on your kids bed! He’s super cute & measures 22″ x 9″ x 6″…making his the perfect bed or chair accent! This guy is definitely more of a sleeping buddy than a pillow but he’s super cute in person. 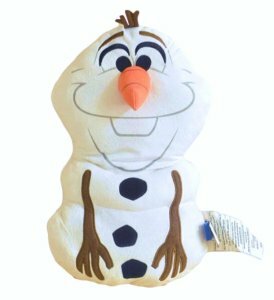 Your child will dream about fighting the eternal winter in Arendelle with the cozy Disney Frozen Olaf Cuddle Pillow. With 100% polyester construction, your little one will love to snuggle the cuddly snowman and take him on adventures. 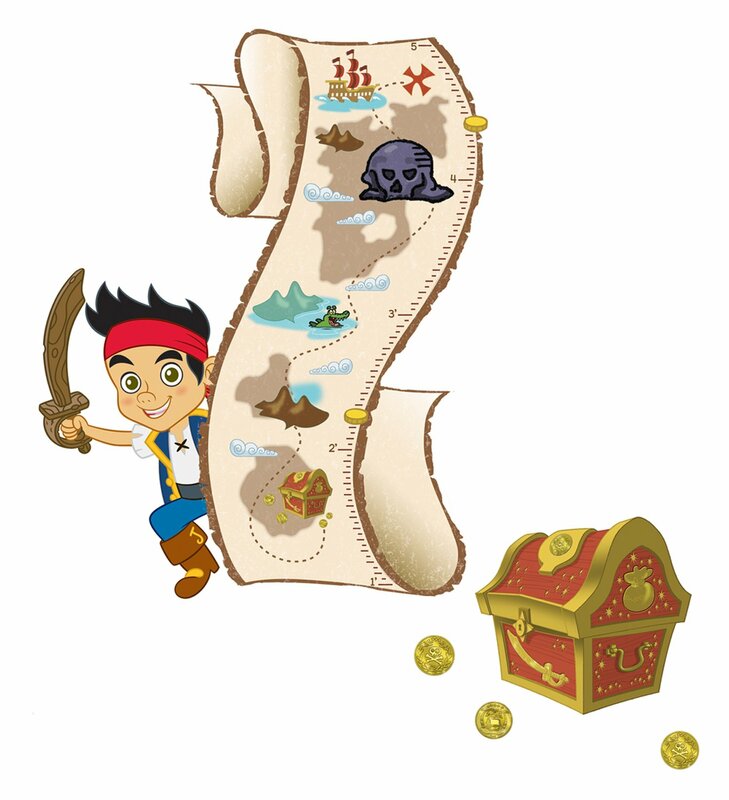 This fabulous wall decal is perfect for adding a tasteful accent you your kids wall. It measures 25.3″W x 12″H and comes in black (if you would like white that’s an option) with accented snowflakes. It’s the perfect size to go over a twin sized headboard. These window panels are the perfect accent for your Frozen themed room. They feature both Anna & Elsa with a floral design. The characters are subtle which personally makes them even nicer! You get a set of 2 panels with 2 tie backs & they measure 82 in x 63 in. 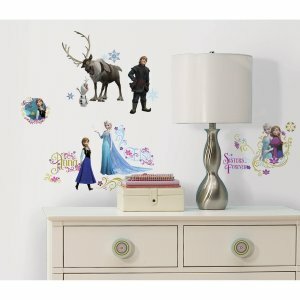 If your looking for a easy room makeover then this set of frozen wall decals will be perfect! The set comes with 36 wall decals, decals range in size from 1.3″wide x 1.2″high to 12.34″wide x 13.9″high. They will stick to anything smooth and flat so mirrors, trash cans, dressers and even headboards can be adorned with this groovy decals! If you feel frisky they also do great on ceiling fans. You have enough to do scenes on the wall…but not really an entire room unless you like it sparse. If your toddler is about to bust out of the crib then get her a big girl bed she will adore! 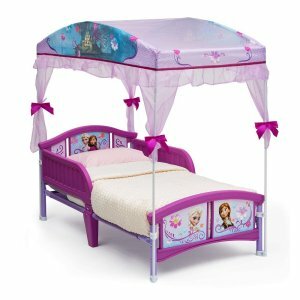 The Frozen Toddler Bed has purple accents & Frozen graphics with a charming canopy that screams princess. 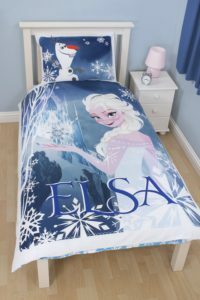 Whether you are going all out with a Frozen theme or just adding some accessories the bedding should be your first stop! In a bedroom the bed is the focal point so a quick bedding change and the entire room will feel different. 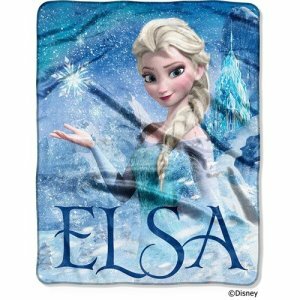 If you are looking for a fab fuzzy blanket in a Frozen theme then this could be the one for you! It’s super soft and features Elsa with a blue color palette. The Blanket measures 40″ x 50″ and is great for snuggling on the couch or even to use as your kids official Frozen bedding! 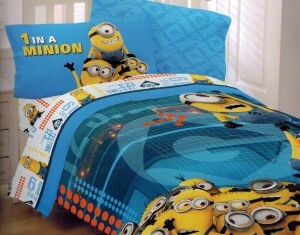 If your kids have a perfectly good comforter already then why not keep it & get a duvet cover? It save a bit of cash & looks just as cute as the regular bedding sets! Please note that this one is from the UK so it’s a couple of inches smaller than what you might have at home. It still works great just fold the edge over a bit. I promise the kids won’t care at all. If your kids love Olaf then this is going to be the perfect accent pillow for Frozen Bedding! he’s embroidered & has a 3D nose, and spiky hair. 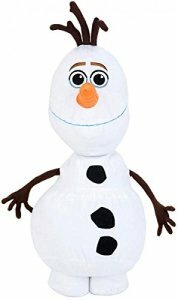 Olaf stands 18″ tall so he’s going to look great on a bed or dresser. He’s just the right size to carry around…plus he’s just too cute to pass up. Most of the Frozen stuff is heavy on the blues…but this one is a cheery floral design with pinks, purples, greens and blues on a light pink background. 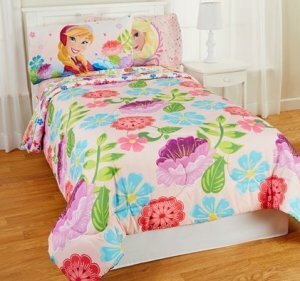 The sheets are just as colorful and the comforter is reversible with a large Elsa & Anna on the reverse. The pillow feature the characters & even more perky flowers. 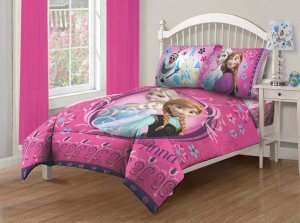 This fabulous Frozen bedding set comes in either full or twin size. 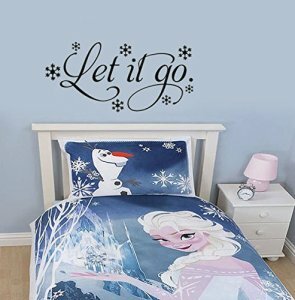 The Frozen bedding set comes with a fitted sheet, comforter & pillow case (2 come with the full set). It features a bright pink design with great graphics & the characters look outstanding. Even Olaf makes an appearance on the pillow case. This set also comes in either full or twin….other than the size the full comes with one more pillow case than the twin set. 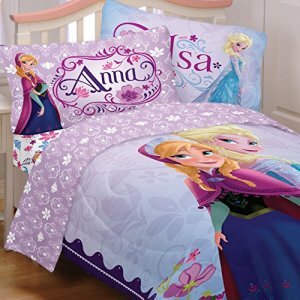 This Frozen bedding set includes bright floral sheets & the reverse has a purple floral design. The characters are front & center on this one! 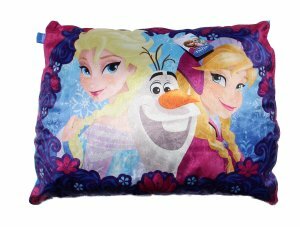 This snazzy Frozen Pillow is perfect for brightening up a kids bed. The graphics are bold & the characters look fantastic! The pillow measures 20″ x 26″ and is made of a silky microfiber. If you want something a bit more custom for your Monsters Inc inspired room then these artists designs are perfect for you, Personally I love art, add in my favorite characters & it’s a win! This groovy Mike Print is perfect for just about any space and features a whimsical take on the classic character. Looks like Mike got quite a bit taller & he’s looking super happy with a light watercolor wash background & stunning design everyone will love. This fabulous art print titled Sully, Monsters Inc is bright and cheery with the perfect color combination to add to your Monsters Inc themed room. it measures 8″ x 10″ & is ready to frame. This Monster easily matches the theme & adds that special custom feel you’re looking for. 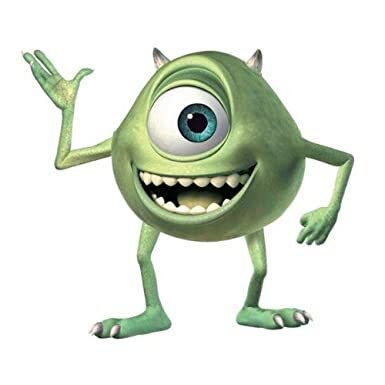 Mike Wazowski is one of the coolest monsters ever created! Or at least he’s super determined and fun to hang out with (or so I’ve heard). This charming print is so cute you can’t pass it up! When decorating a Monsters University room the accessories are the fun part! Mix and match these great items to make that theme jump out and scare you! From clocks to shelf decor & light switches you’ll find all those fab finishing touches here! Even little monsters need to tell time! 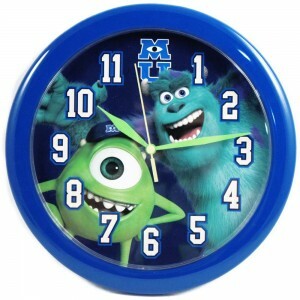 This fab clock features Mike & Sulley with a bright blue frame & classic monster style. 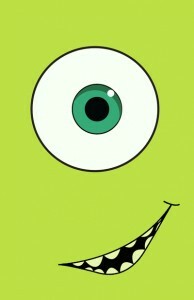 This one is perfect for any Monsters Inc fan! It measures 10″ in diameter & has bright green hands. 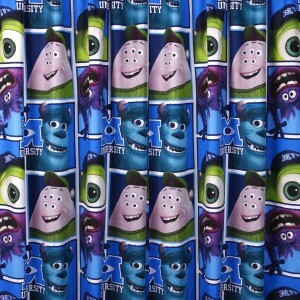 These fab Monster themed curtains are great for adding that finishing touch to the windows. It has a primarily blue vibe with lots of character faces smiling back at you. 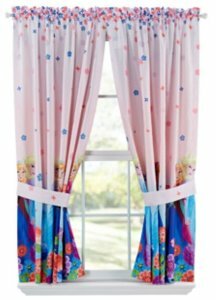 This is a set of 2 curtains with a Pencil-pleat & measure 66″ wide x 72″ drop. This is one of those finishing touches that everyone will notice especially the kids! 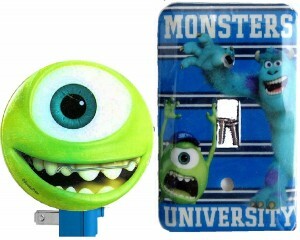 This is gift set includes a fun Mike night-light & a light switch cover with Mike & Sulley in scare mode. Who wouldn’t love these charming gift set? This delightful Mike pillow is nothing short of adorable. he features an embroidered design, classic horns and he’s even wearing his braces! This is perfect for finishing out the bed or just to be used as a floor pillow. It’s 12″ x 12″& machine washable. Your kids will need a hamper however the real Monster Inc Hamper has pretty awful reviews…So I recommend this one, the blue matches & it will hold up for years of kid abuse. It’s roomy enough to hold a couple of loads of laundry & has some sturdy reinforced handles. Since it’s a solid color you won’t have to worry about replacing it when the kids get tired of the characters. Pop! Minis Disney Monsters, Inc. This adorable duo is great for finishing out a bookshelf or dresser. They are made of tick vinyl & are fine to play with as well! They are made by Funko & feature caricatures of Mike & Sulley. These are also the perfect thing for the adult collectors as well…I have some in my office! 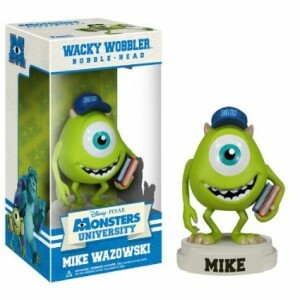 When you’re a die-hard Monsters University fan you have to love all the cool toys…Er Collectibles! These groovy bobble heads are by Funko & called Wacky Wobblers. You have three fab options here so get your favorite or collect them all. Randall in college is much different from later in his life, he’s almost charming! 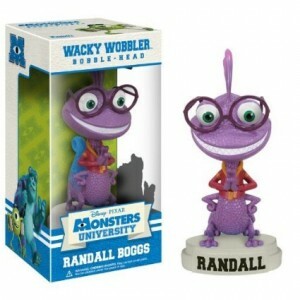 This fun Bobblehead is 6.75″ tall & features Randall in the school jacket with glasses & a perky disposition. Just think of how his life would have been different if he was more popular in college! Who doesn’t love Mike’s infectious attitude? He’s sporting a blue MU hat & a stack of books…he’s ready to Scare! Since he’s sort of all head he wabbles from the waist-ish area…it’s hilarious. Sulley is ready to scare! 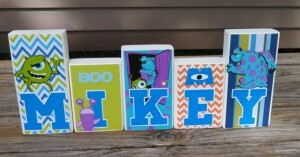 He stands 6.8″ tall & is his adorable blue self with a green OK T-shirt & his name printed across the bottom of the base. These are perfect for kids spaces to decorate shelves or even in your office…we know you want one too! Looking for some Snazzy Minion Wall Decals? Minions are possibly my favorite characters in any movie I’ve ever seen…which says a lot since I’m a total movie buff. I’m not sure if it’s because my dad called me an evil minion all the time or that I’ve just been hypnotized by their chubby yellow bodies & blue overalls…The welding glasses are a nice touch too! Either way I simply cannot get enough of the minions…cakes, toys, board games…it all makes me laugh. 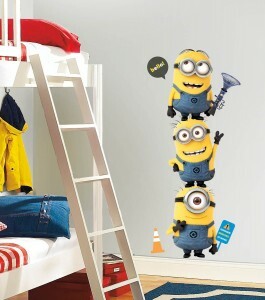 This groovy wall decal set is by RoomMates & features 3 minions …they can be stacked as shown or not as they come on a sheet separately. They also have a few spiffy accessories…a traffic cone, fart gun (of course), Bello quote blurb, caution sign, apple, banana, & two cupcakes. Perfect for tricking out your office, kids room or even adding a little class to that painfully boring laundry room. 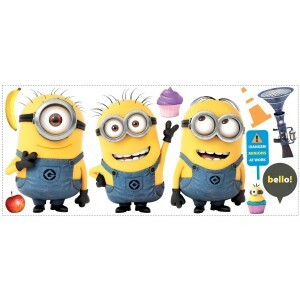 if you stack your minions you get a decal that is 48″ tall & somewhere around 18″ wide. These decals are super easy to apply just peel & stick to any flat surface like walls, doors, mirrors or even furniture. They are made to be removed & repositioned so they won’t hurt your walls or leave an weird sticky crud behind…which also makes them great for apartments or rental spaces. If you are as obsessed about these as I am then you’ll be delighted to find out they make a growth chart & set that includes more of the cast, they also match perfectly with this one. Ideal for a full room makeover! Now this is an impressive piece of art! This is a hand painted piece of wood that will totally be the focal point of any kids room. It’s pretty large so make sure you have the wall space for these guys. You can see more pics Here or order it. Nothing beats a snugly blanket on a chilly night. These are super soft & perfect for an added layer on the bed, couch surfing or even for the car. The pillows have a 3D vibe that will make their bed really come to life! Monsters University Plush Twin Size BlanketBuy It! 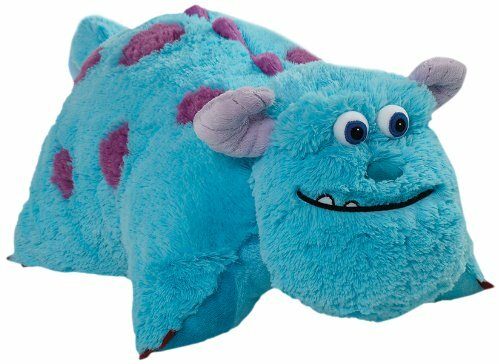 Pillow Pets 18-Inch Square Sulley PillowBuy It! 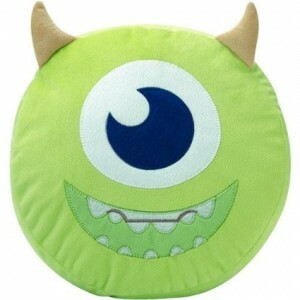 Disney’s Monsters University Stare BlanketBuy It! Once you decide to go monster you are pretty limited to the furniture that Pixar has release…or are you? Turns out you can get really creative with stuff already on the market that matches the color scheme & whimsical style perfectly for a Monster room! The trick to themed rooms is making the the furniture rather neutral & interchangeable. Then when the kids get tired of the theme you don’t have to repurchase everything they own. On quick glance these stools, chairs and tables are not really themed…until you put them in the middle of a Monsters Inc themed bedroom! 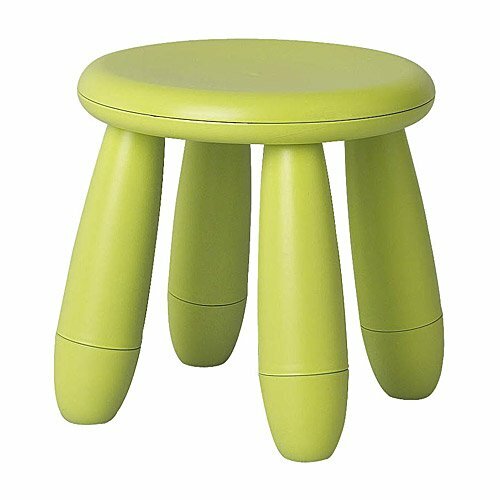 Mammut Childrens Green StoolBuy It! Blue Mammut Kids Children’s ChairBuy It! 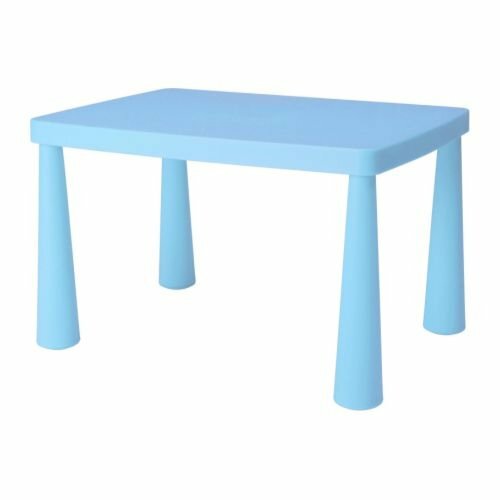 Mammut Blue Kid’s Children’s TableBuy It! Mammut Children’s 3 PcsBuy It! Not sure how you want that Monsters theme room to look? Check out these great finished rooms for inspiration! You can mix and match any design to get the perfect look for you & your kiddo. You get to get creative with this one! 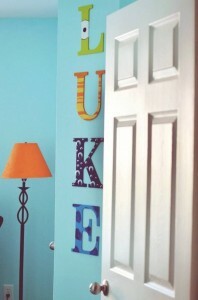 All you need is a bit of paint & some letters. you can find the letters online or at any local craft store in just about any font you might want. These are pretty classy for just a name or you could go with a complete alphabet set. Skies the limit on this fab project. 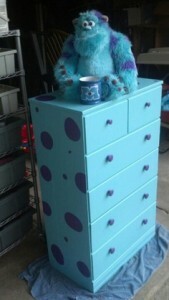 Make Your Very Own Monster Dresser! This project is fun, you just need some paint & an old dresser! You’ll want to paint the base in a bright sully blue. Simply take anything with the character on it to the paint store & they can match the color. Then you can either use a circle stencil to paint the dots or use some circle wall decals. The drawer pulls simply get painted to match the purple. You don’t have to stop at the dresser. You can also make green mike a headboard with a big eye or matching night stand. The round stencils are all you will need to make a custom Mike Wazowski piece of furniture. Since you have the paint & stencils out I would also make a lampshade. Be sure to send us pictures and we will feature your makeover! When you decorate a kids room in a new theme the first place to start is the bedding…a new bedding set changes the entire feel of the bedroom. It is the focal point after all! So find the perfect set for your little monster & then go find some crazy cute accessories to match. 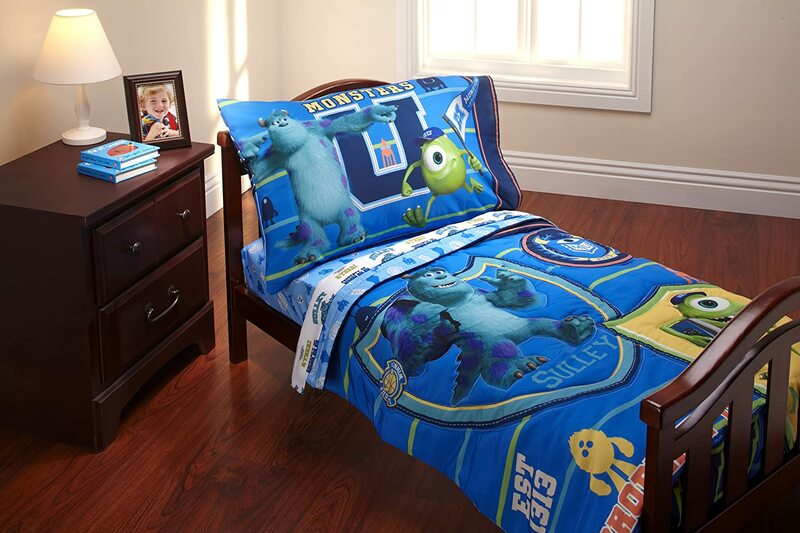 Monsters University 4-Piece Reversible Twin Bedding SetBuy It! Disney 4 Piece Toddler Set, Monsters UniversityBuy It! 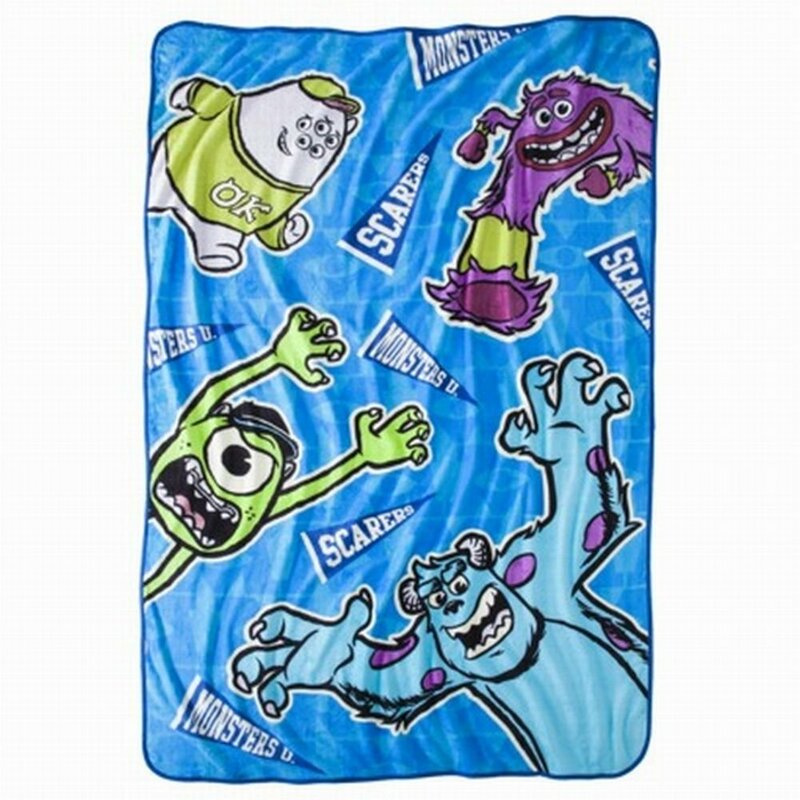 Disney Monsters Inc Twin Bed Comforter Scare UniversityBuy It! 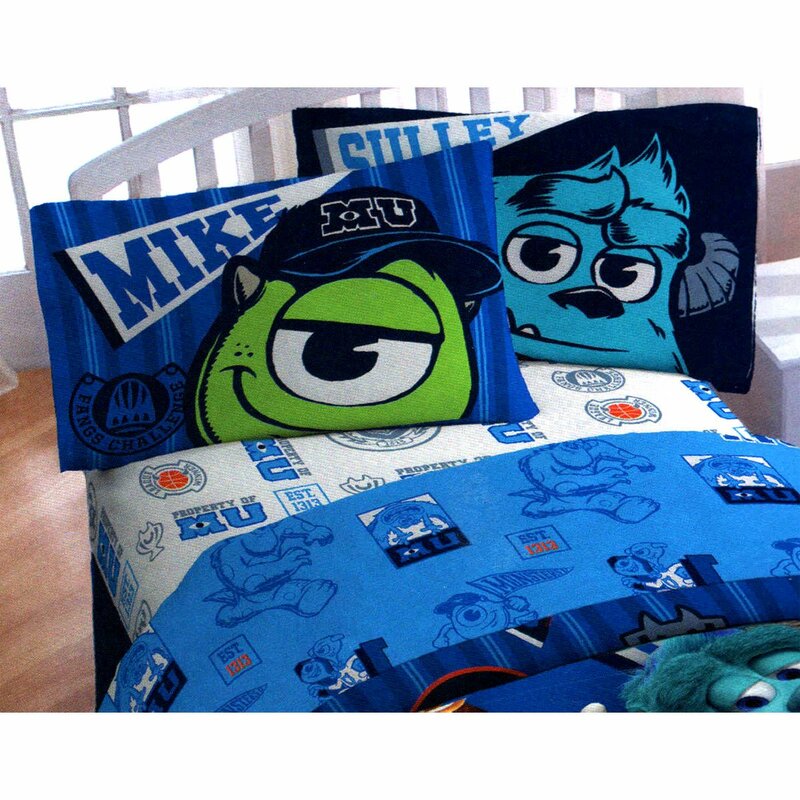 Monsters Inc Bedding CollectionBuy It! Add some bling to your kids wall with these giant wall decals…they are fun, easy to apply & remove without messing up your walls. Perfect for kids rooms! The large decals are great for creating a custom accent wall & the little sets are good for making scenes on the wall or even adding a little accent to mirrors, the headboard, dresser or even a trash can. They will adhere to anything smooth & flat so get creative. 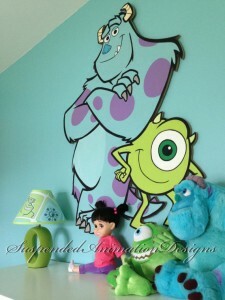 Monsters Inc Giant Sully & Boo Wall DecalsBuy It! 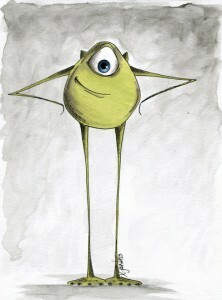 Monsters Giant Mike Wall DecalsBuy It! 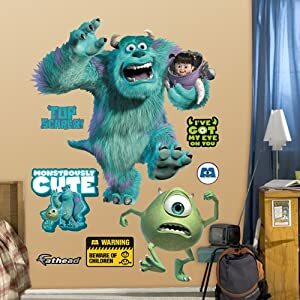 Monsters Inc. Fathead Wall DecalBuy It! 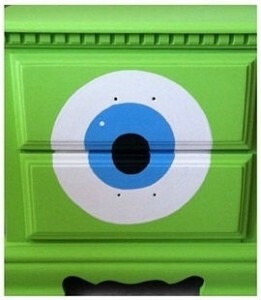 Monsters Inc. Peel And Stick Wall DecalsBuy It! There just isn’t enough stuff with “Little Monster” on it! Perfect for any nursery, or playroom. If you are thinking of adding stripes to the room then this is the Perfect wall decals set for that…the monsters are just halves! You can make them peek over the dresser, headboard, mirror or get creative with stripes & a chair rail. Get Some Custom Monsters Lettering! You can get Custom artist made lettering on Etsy…they look fabulous too! What kid wouldn’t love their name written in monsters? She has lots of other options too…so be sure to browse around! Clearly no Bedroom would be quite finished without one of these little cuties on the bed! This is handmade & can be found on Etsy right here. Perfect for those that like a custom touch. If your kid is obsessed with these chubby little workers then this is the perfect bedding set for them. It comes with 1 pillow case, fitted sheet, flat sheet & microfiber comforter. 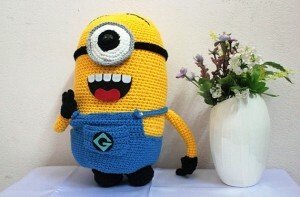 The colors are vibrant & those cute little minions are all over this! 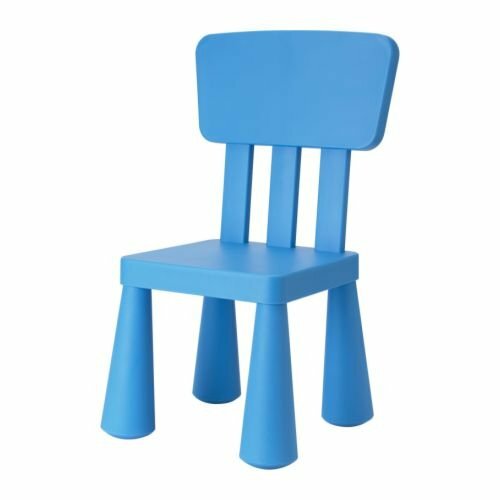 If you looking for the top of the line for cute toddler chairs then this one is for you! It’s pint sized and perfect for little people. It also folds flat to get it of the way whet not in use. 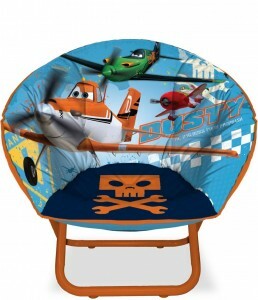 Get your very own Disney Planes Chair Here! 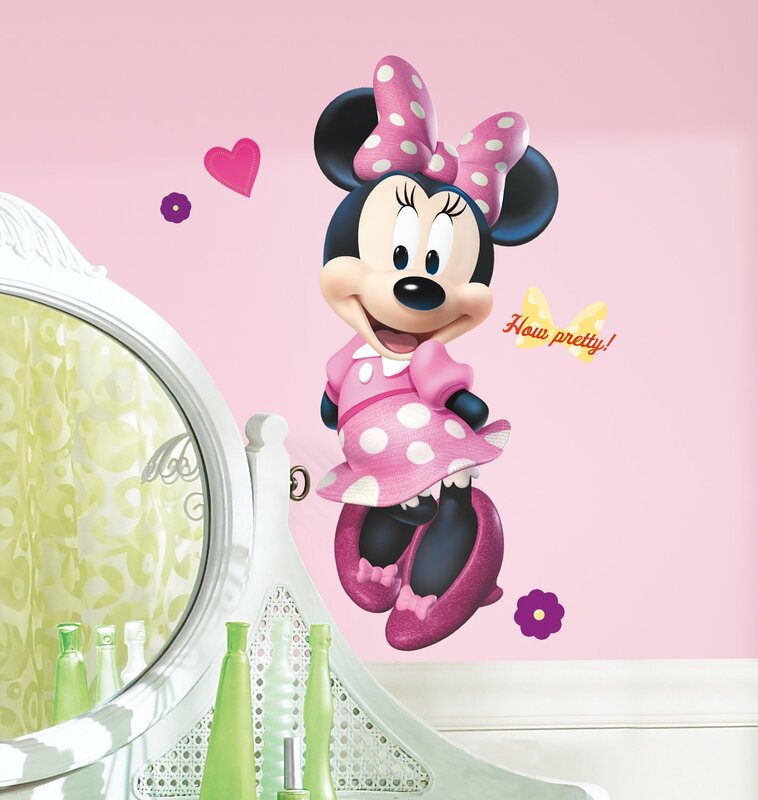 Minnie Is sure to add a touch of cuteness to your kids decor. The Decal measures 18-Inch wide by 39.5-Inch high & it’s a peel & stick that can be moved or repositioned with no problem. The kit comes with the main Minnie decal & several smaller accent decals shown. Mickey and Friends Minnie Bow-tique Peel and Stick Giant Wall DecalBuy It! If your looking for an adorable pillow for your kids…you found it! This pillow features a classic looking Minnie Mouse with pink polka dot bow & cheery smile. Great for adding a Minnie Mouse accent to your kids space! 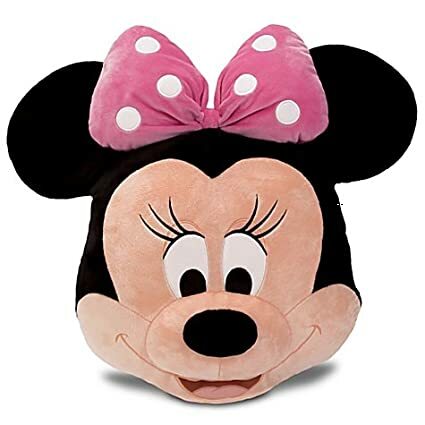 Minnie Mouse Plush Head Cushion PillowBuy It! This super soft Mickey pillow is sure to be the hit of nap time! Perfect for a Mickey themed room or just as a fun accent…no age limit on this one! 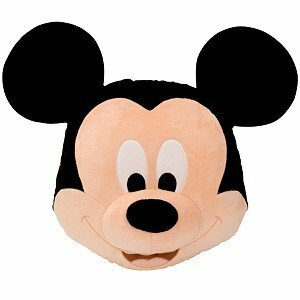 Mickey Mouse Plush Head Cushion PillowBuy It! Nothing finishes off a themed bed quite like a fun Agent P pillow, he’s super soft & perfect for snuggling. 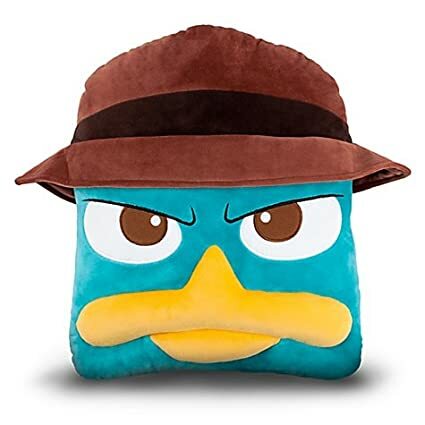 Phineas and Ferb Agent P Plush Pillow Buy It! Bedtime will be a wacky time with a little help from one of the kookiest characters around! 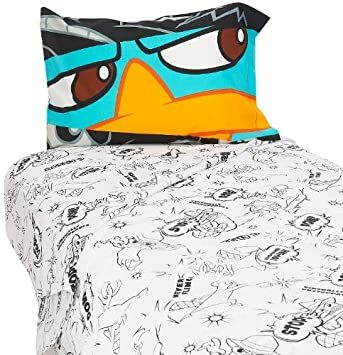 This Disney Phineas and Ferb Full-Size Sheet Set is designed with loads of silly black-and-white pictures of that feisty Perry the Platypus. The two pillowcases each display a full-color close-up of Perry’s face, allowing him to keep an eye out for you all through the night. Disney Phineas and Ferb 4-Piece Full Sheet SetBuy It! 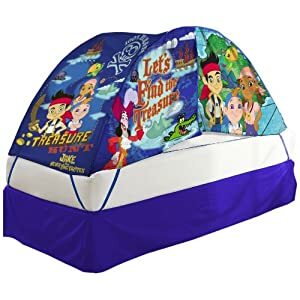 Your kid will love to have adventures under their Disney Phineas and Ferb Bed Tent and Push light. The nylon tent shell comfortably holds one person on most twin beds. Disney Phineas and Ferb Bed Tent with PushlightBuy It! Phineas & Ferb ” Agent P” fluffy soft Fleece Blanket. It’s an ovewrsized 62″x90″ & perfect for your kids Phineas and Ferb room. 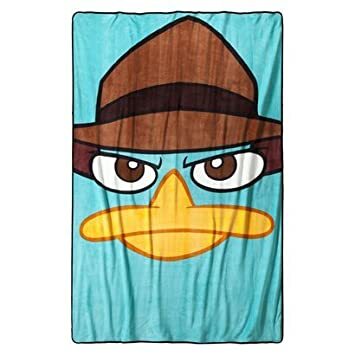 Disney Phineas and Ferb BlanketBuy It! This Turbo sheet set from Northwest comes with a flat sheet; fitted sheet and one pillowcase. It matches the comforter perfectly. 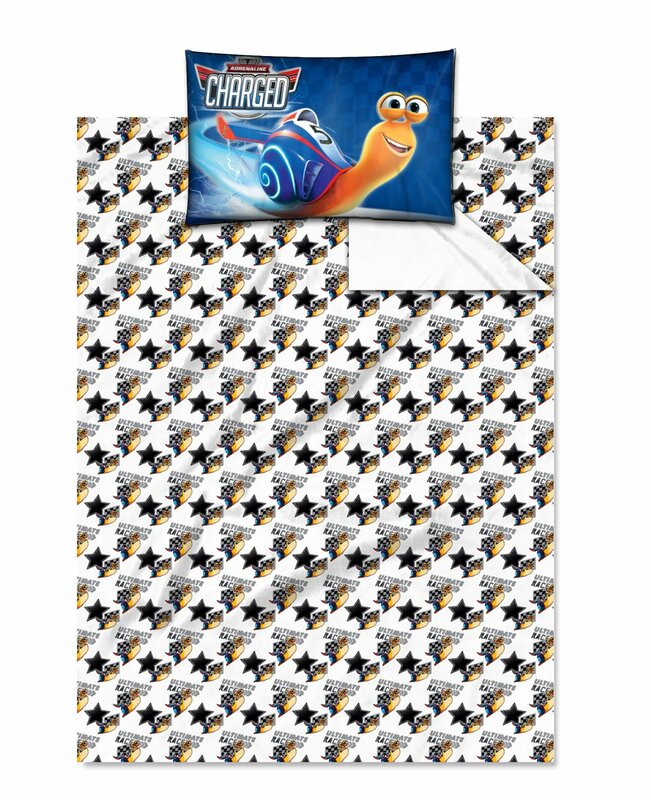 DreamWorks Turbo Too Fast Twin Sheet SetBuy It! 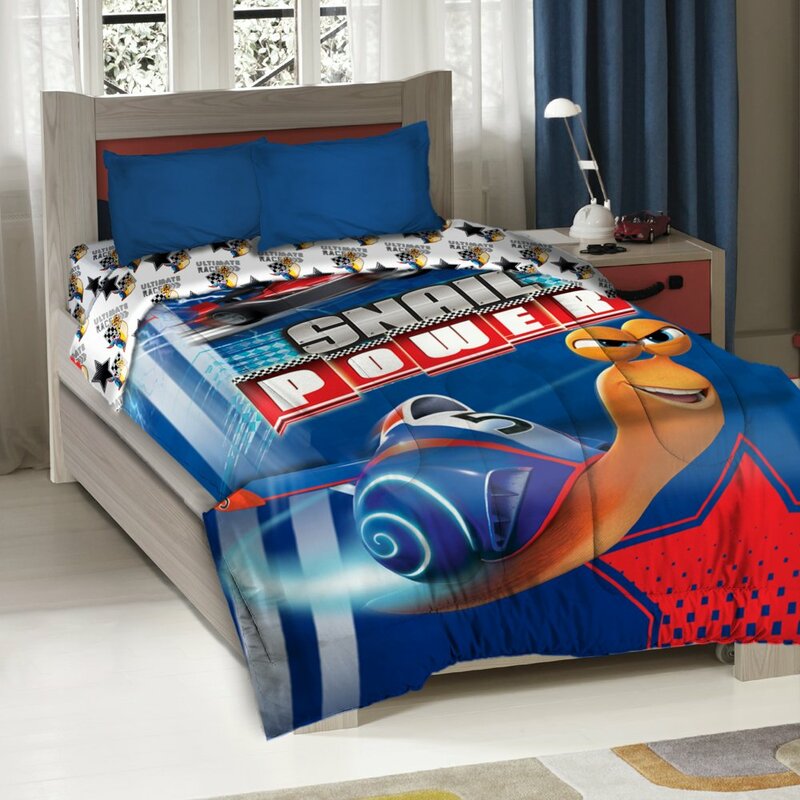 Every kid needs a snazzy comforter for their bed, this one features Turbo the snail. It has great graphics & crisp colors. DreamWorks Turbo Too Fast Twin Sized ComforterBuy It! Do you kids love Turbo, the fastest snail on the planet? This super soft fuzzy blanket is sure to be the favorite & it look fabulous! 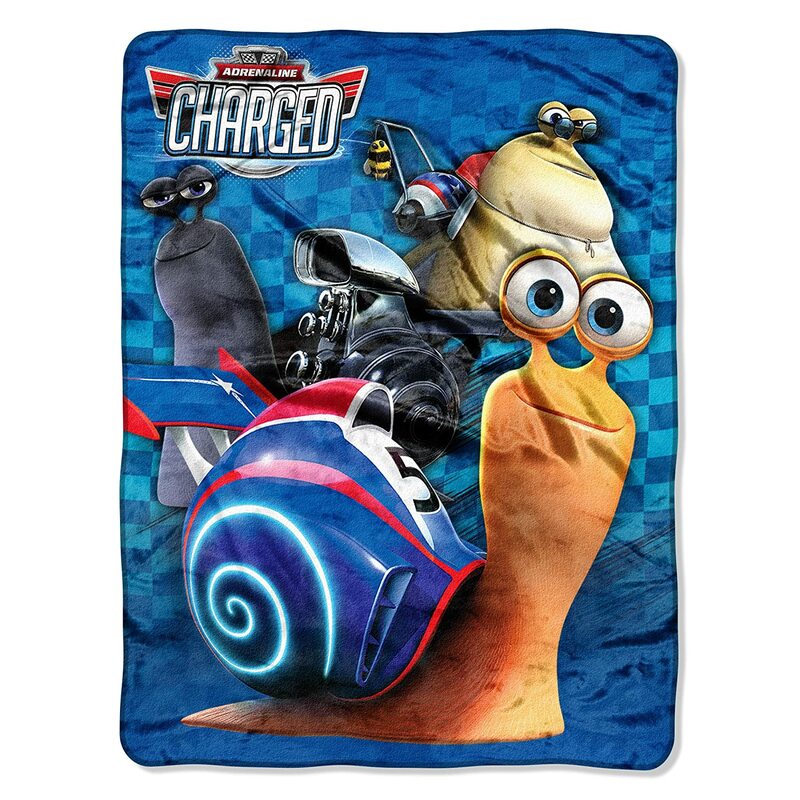 DreamWorks Turbo Checkered Flag Kids BlanketBuy It! 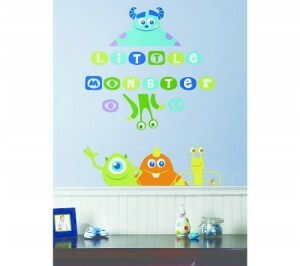 Trick out your kids wall, mirrors & furniture with these groovy wall decals featuring the Monster U crew! Monsters University Peel and Stick Wall DecalsBuy It! It’s so fluffy! Here’s an extra soft, cuddly unicorn you can’t resist. 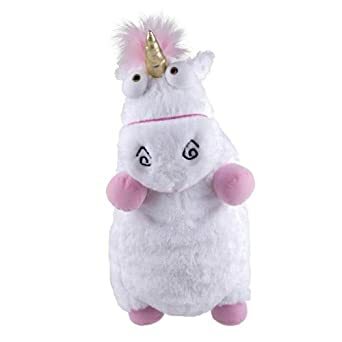 This lovable pillow plush has fuzzy pink mane and tail, shiny fabric horn and big, gazing eyes. Despicable Me Fluffy Unicorn Pillow Plush LargeBuy It! Are your kids die hard minion fans? Get them a cool poster featuring their favorite minions…surely their favorite one is in there somewhere. Despicable Me Minion Movie PosterBuy It! Hey, don’t forget about the rest of the gang! These life size (AKA monster sized) standup posters are ideal for kids spaces, offices or playrooms! They make a great addition to that Monsters U Bedroom decor. Monsters University Art Lifesize Standup PosterBuy It! Monsters University Mike and Sulley Lifesize Standup PosterBuy It! Monsters University Hardscrabble Lifesize Standup PosterBuy It! Monsters University Johnny Lifesize Standup PosterBuy It! Monsters University Randall Boggs Lifesize Standup PosterBuy It! Monsters University Mike Wazowski Lifesize Standup PosterBuy It! Monsters University Sulley Lifesize Standup PosterBuy It! This Monster University Night Light is the perfect amount of light to keep your young one feeling safe and comfortable in the dark. A Monsters University graphic illuminates through the shining light. Monsters University Night LightBuy It! Every kids needs an activity table to create those wonderful art projects on, get one in a cool Monster University theme! 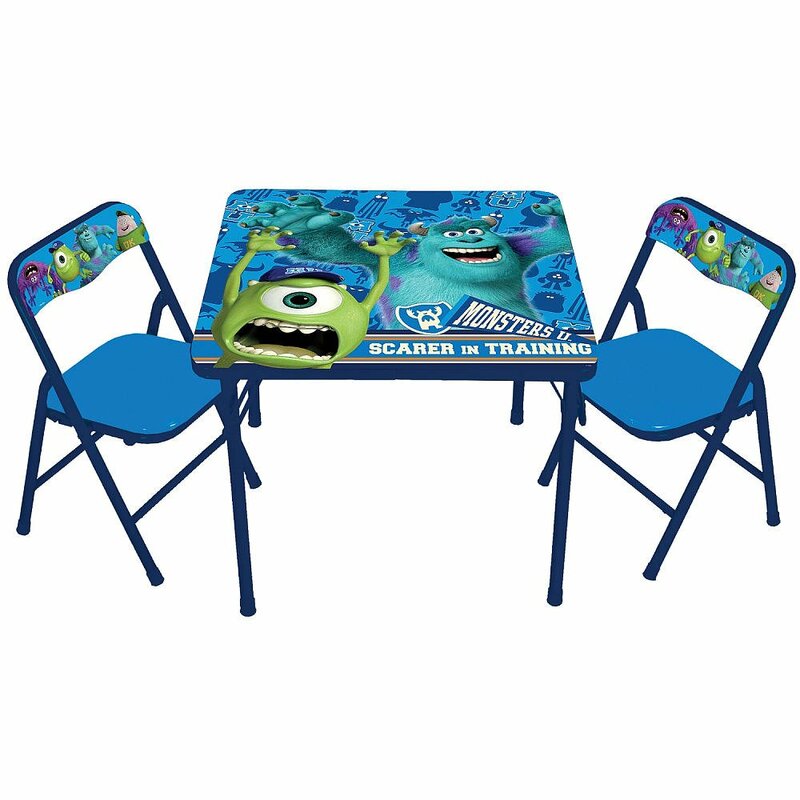 Monsters University Classic Activity Table and Chair SetBuy It! 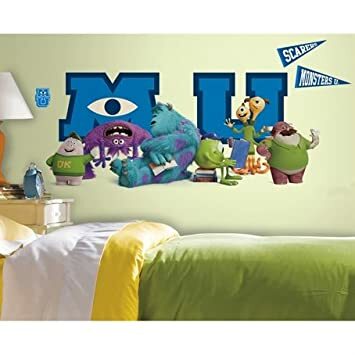 Bring Sulley, Mike, and the rest of the Monsters University crew into any bedroom or play area with these giant wall decals. The decals go up easy, are long-lasting, and can be removed and repositioned at any time. A great way to delight scarers in training! Hit the books kids! 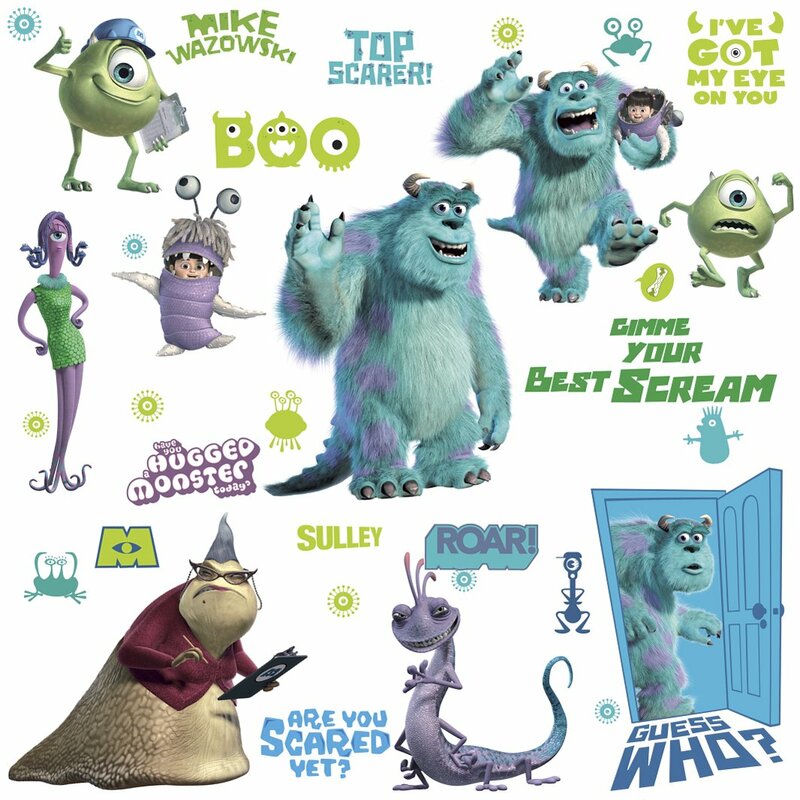 Monsters University Wall Decals MegapackBuy It! 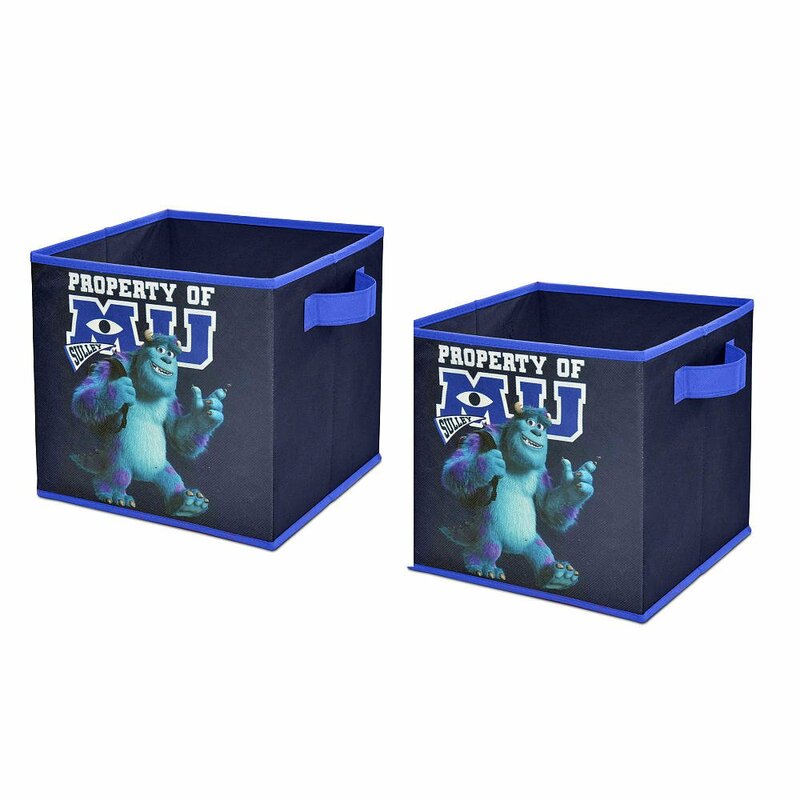 The 2-Pack Monsters University Storage Cubes are a practical way to keep your kids space organized. 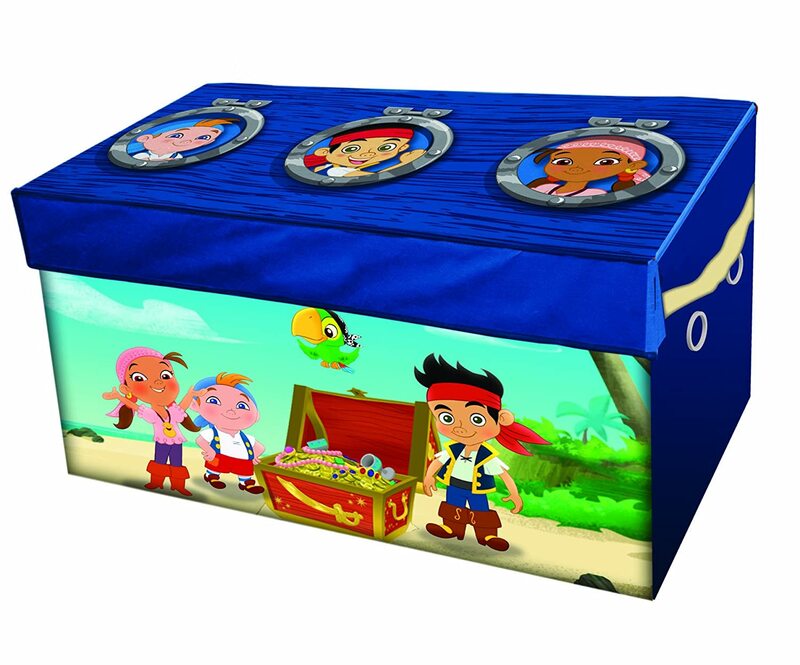 The cubes are very versatile and can add both organization and decoration to nearly any area. This set includes two storage cubes with a Monsters University design and handles for easy carrying. Perfect for toy storage, laundry, books, bathroom storage and more. 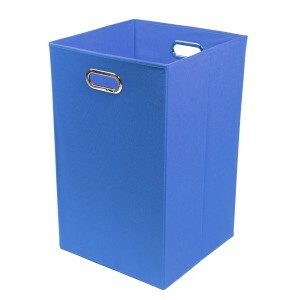 The 2-Pack Monsters University Storage Cubes can help make organizing your kiddo’s messy room easy and fun. Disney Pixar Monsters University 2-Pack Storage CubesBuy It! 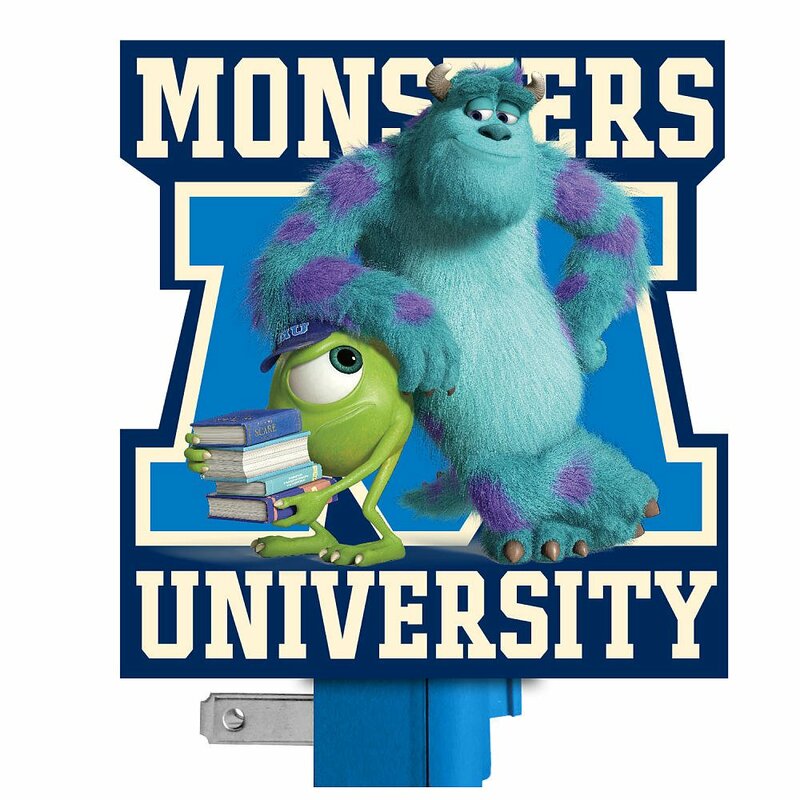 Add some playful decor to your child’s room with this Monsters University Magnetic Wall Art. 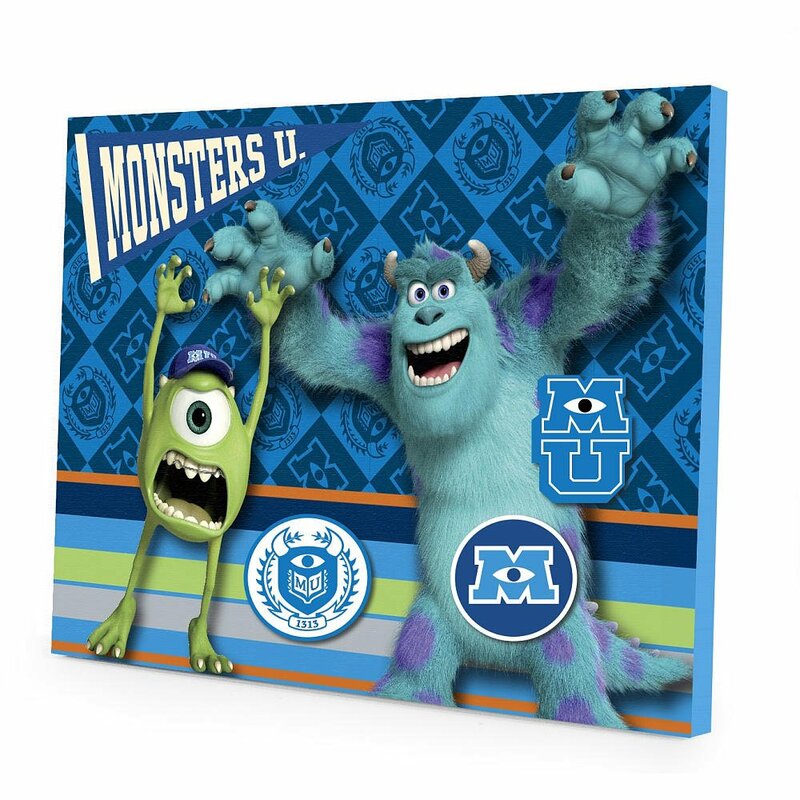 This Wall Art features a Monsters University magnetic design and comes with coordinating Monsters University magnets. Can be used as a decorative memo board! Disney Pixar Monsters University Magnetic Wall ArtBuy It! This charming blue Monsters University Table Lamp will make any kid brave enough to face the dark. With its graphic shade, it will fit perfect in any kid’s room. 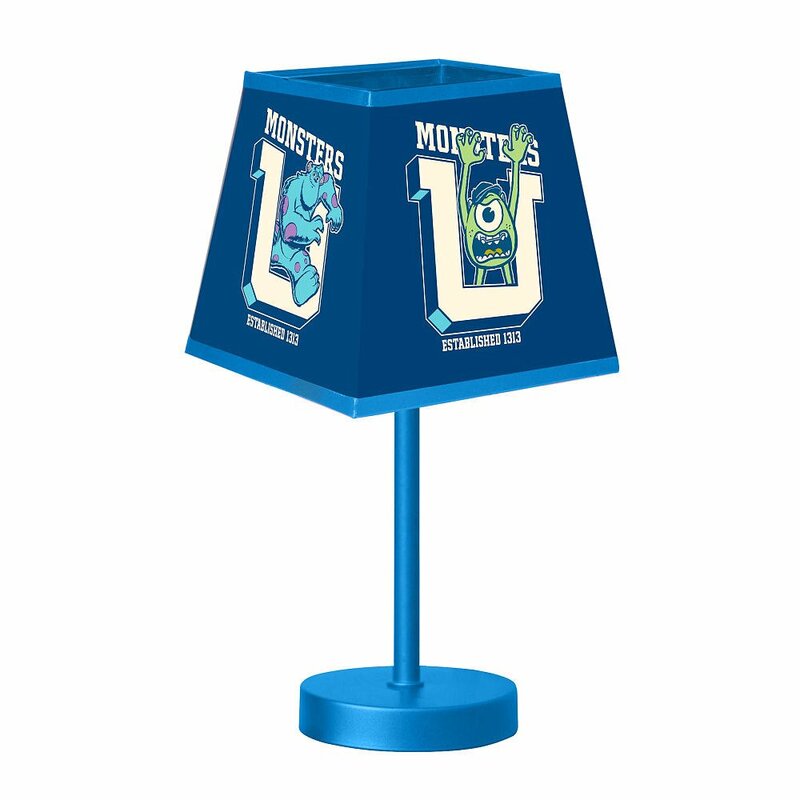 Disney Pixar Monsters University Table LampBuy It! 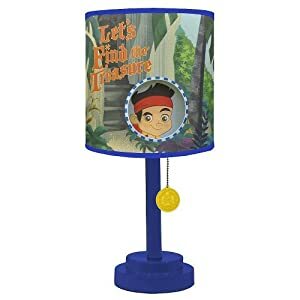 The Monsters University 3 Pack Wall Hook is a perfect way to keep your child’s clutter off the ground. The decorative hooks are perfect for jackets, backpacks and much more. Features three different Monsters University designs. 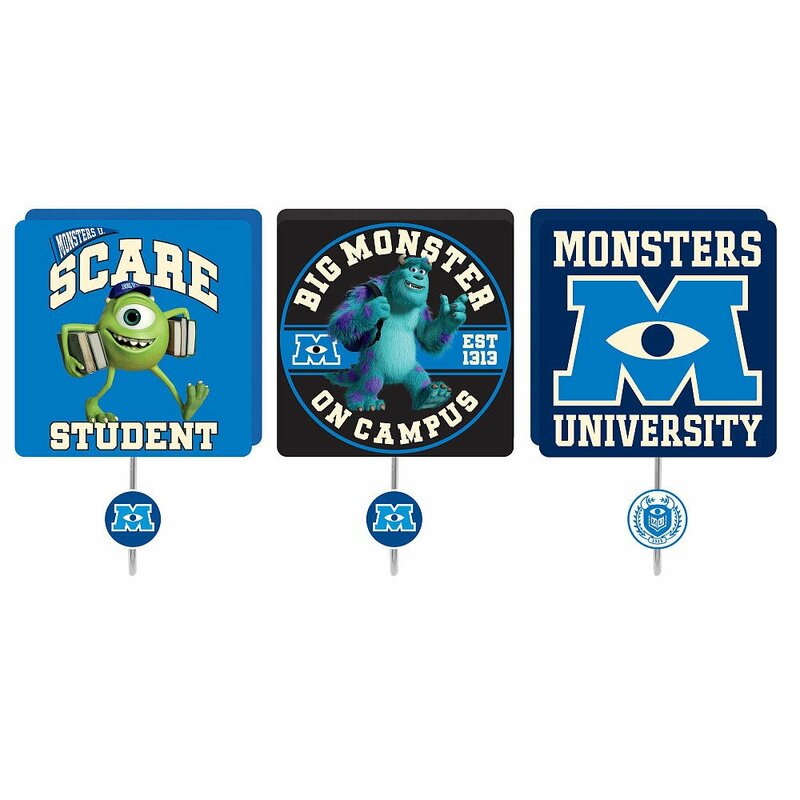 Monsters University 3-Pack Wall HooksBuy It! No kids bed is complete without a super soft plush friend to hang out with. 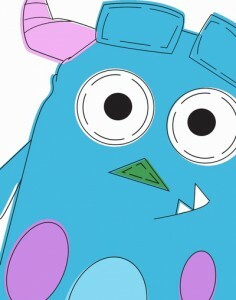 He’s the perfect accent to any Monster Inc or University Bedroom decor. 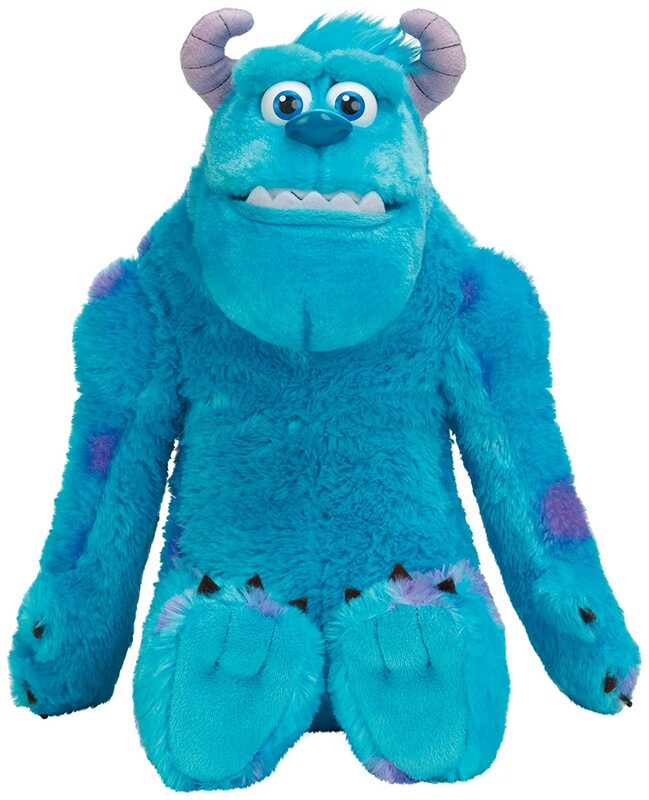 Monsters University My Scare Pal SulleyBuy It! 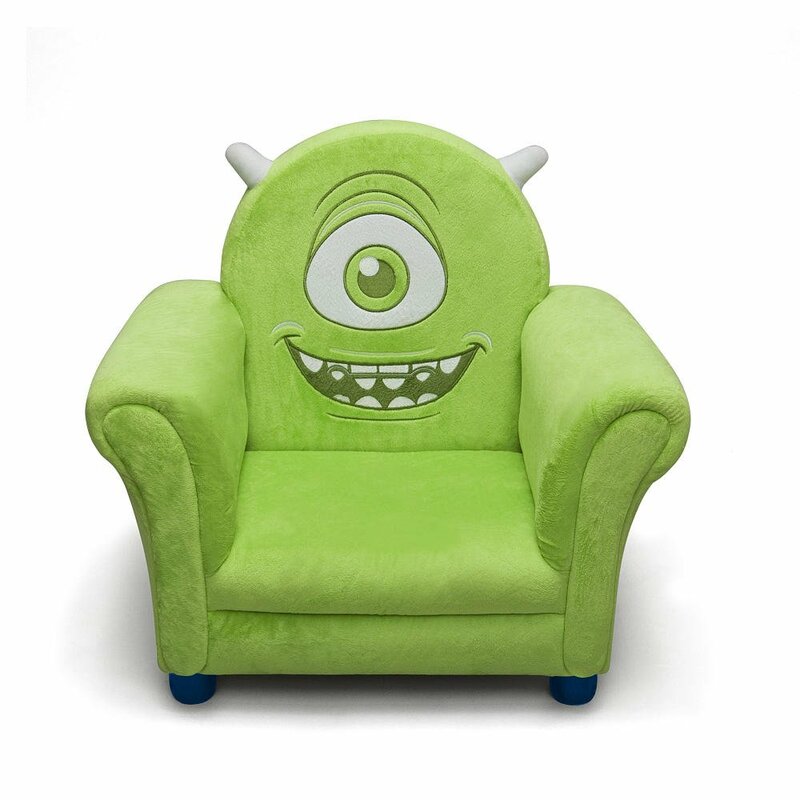 This awesome Monsters University Upholstered chair is the ideal chair for your little scarer. 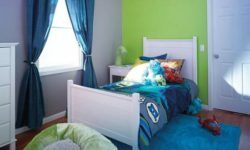 It features a cheery and not so frightening Mike Wazowski (complete with braces), a comfy velvet touch, and a bright neon green color all translating to the most comfortable spot for your little Monster. The Upholstered Chair is also built with a sturdy durable frame making it the perfect chair for studying and relaxing after a long day of school. Monsters University Upholstered ChairBuy It! Tired of the kids crawling all over you on the couch? Get them their own pint sized chair, it great for watching TV reading or just hanging out. 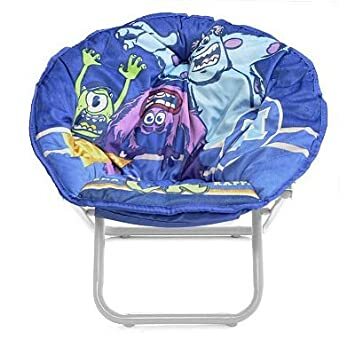 Disney Pixar Monsters University Saucer ChairBuy It! 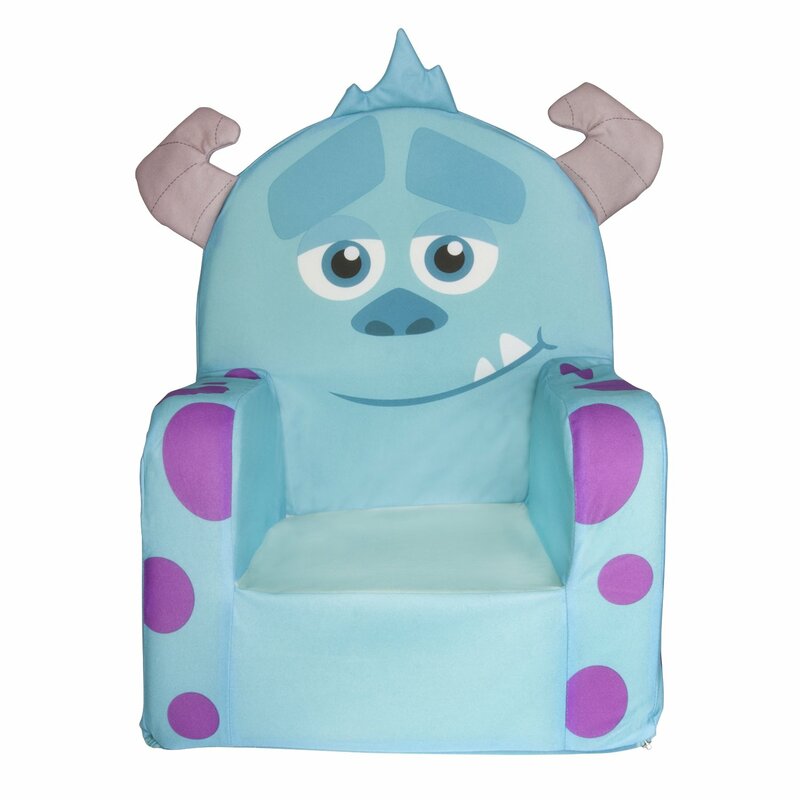 Get your toddler the cutest monster chair on the planet…It’s a big blue Sully! 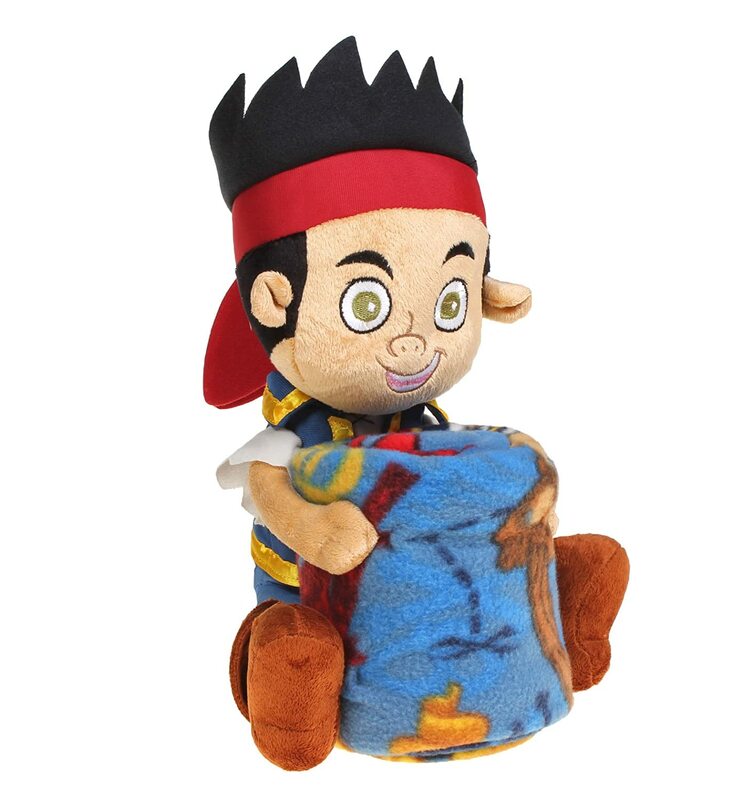 He’s super soft & foam filled so kids will love climbing all over him! 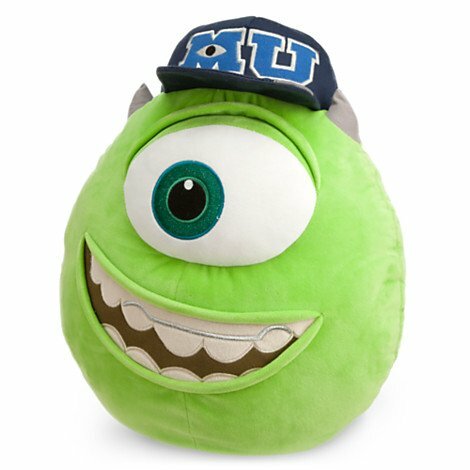 Marshmallow Monsters University Sulley Character ChairBuy It! 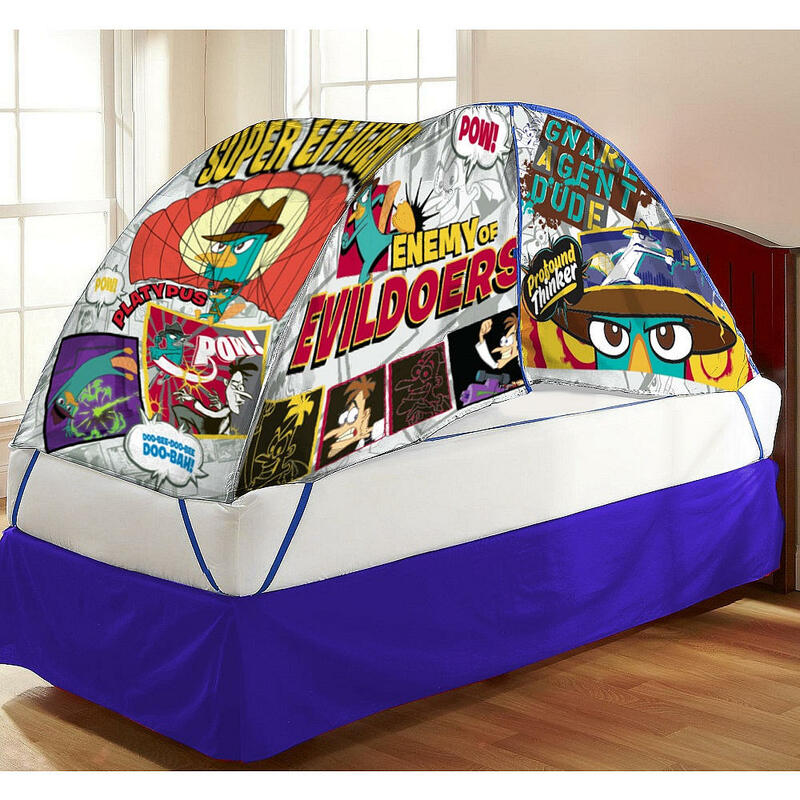 Trick out your kid boring bed with this snazzy bed tent that even has a push light. It features the coolest monsters from the Monsters Inc Disney movie. 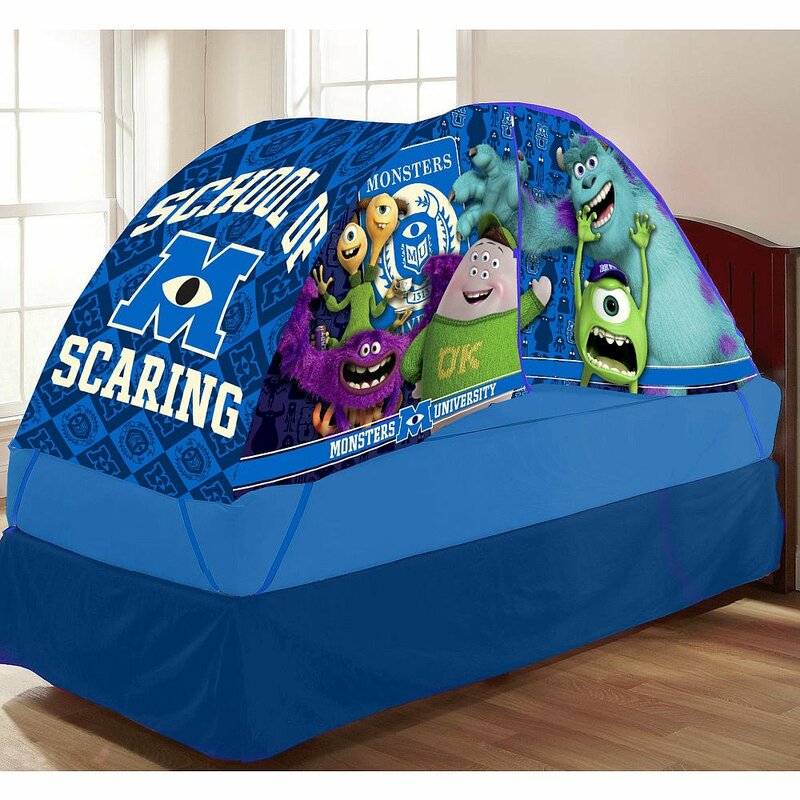 Monsters University Bed Tent with Push LightBuy It! Is your kids favorite university Monsters U? Get the schools logo wall decal to finish off that monster themed room…it’s easy to apply & won’t even hurt the wall. Fathead Monsters University Logo Wall DecorBuy It! 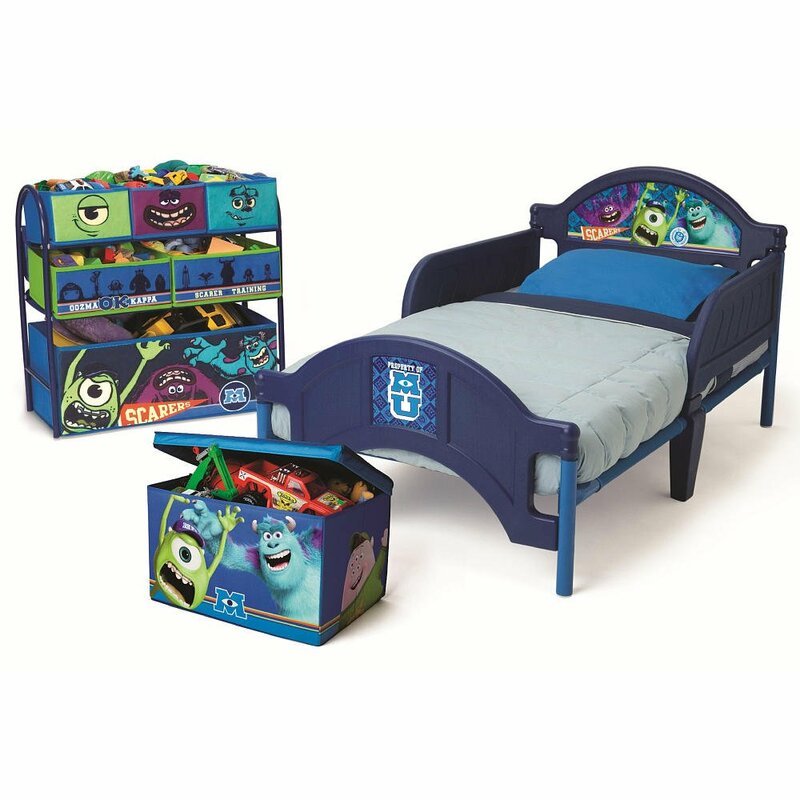 Do a whole room makeover with this fun set by Monsters Inc…it comes with a toddler bed, toy box & large storage chest that even the kids can use. It’s the perfect addition to any monster lovin kids room. Disney Pixar Monsters University 3-Piece Room in a BoxBuy It! Already have a nice toasty comforter for the kid? 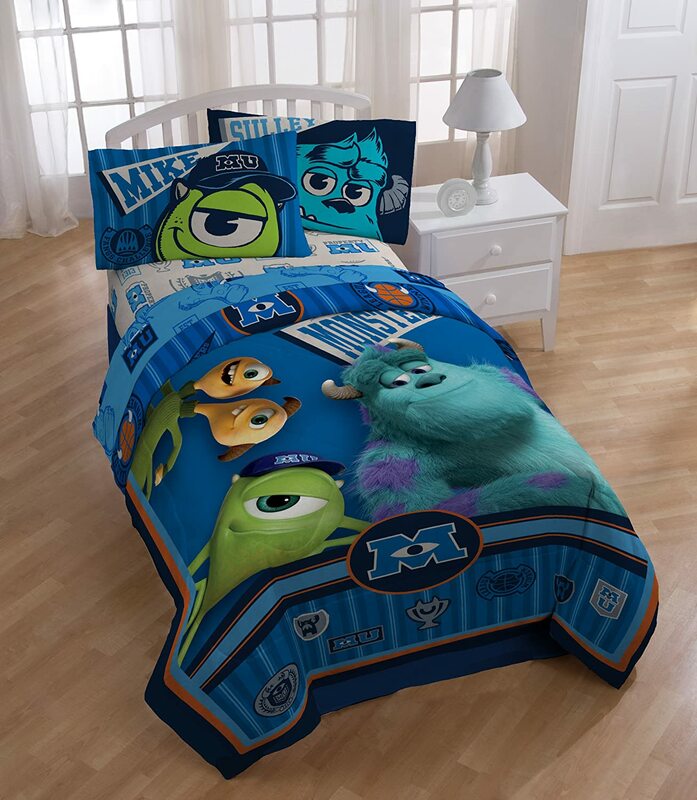 Keep it & get a nice duvet cover to change the rooms theme to whatever your kids desire…in this case Monsters! 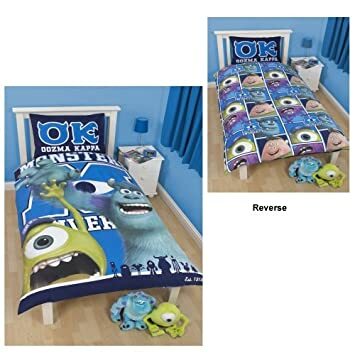 Monsters Inc ‘University’ Reversible Duvet Cover With Pillowcase SetBuy It!